Posted March 27, 2012 in kinetics. First, allow me to apologize for this post. I regret that I am forced to use images already in my library, because my scanning equipment is temporarily disabled. Therefore, the post may not be up to my standards, but I will do my best with what I have on hand. I’d like to discuss the concept of vectors here. As defined by blogger Jesse Hamm, Vectors are invisible lines that chart the paths our eyes will likely take through a picture. This is certainly not a new concept for this series. 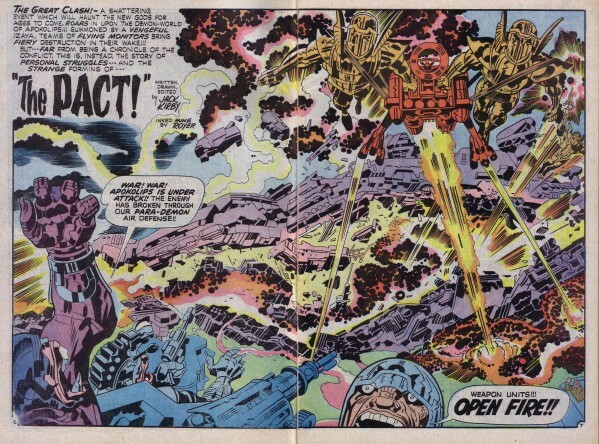 It is only a new term for me to use that is direct and appropriate while analyzing Jack Kirby’s work. The King’s use of vectors is one of the essential factors that makes his work so powerful. In many cases, Kirby will use vectors moving in harmony and opposition to create drama. 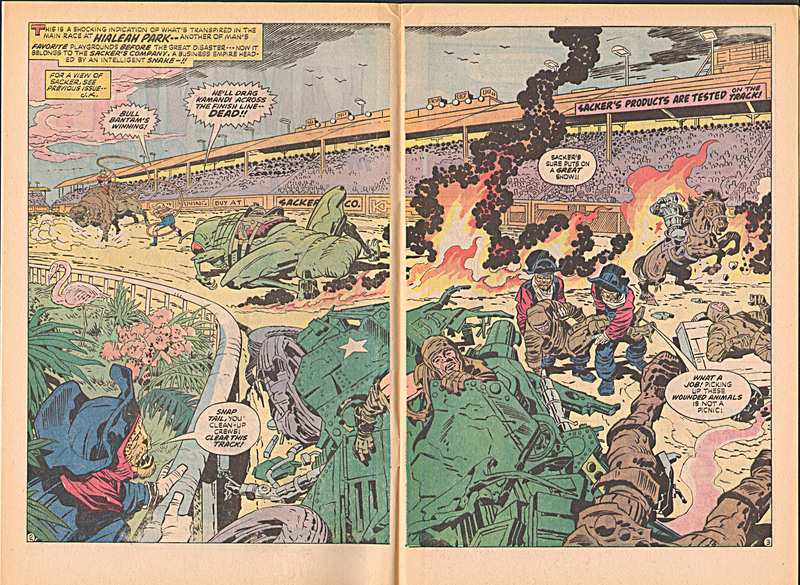 If for example we study this Kamandi spread, we notice the diagonal vector of the stadium roof which sweeps the eye from left to right. This vector also supports the shapes of Bull Bantam, Kamandi and Klik-Klak. Working in tandem with the diagonal, the curved vector if the railing on the lower left reinforces the shape of the demolished tank in the foreground, as well as the movement of the leopards carrying the injured racers off the field. Vectors work hand in hand with lattices to break up the composition three-dimensionally and emphasize aspects that the artist wants to feature prominently. The vectors created by large horizontal and vertical shapes are fairly obvious and easy to detect. What might not be as apparent are the smaller vectors created by lesser shapes throughout the composition. For instance, as well as the obvious vector of the diagonal mass of machinery from left to right on the New Gods page above, we also have the vector of the massive raised arm on the left, the cannon at bottom center, and the various weapon blasts emanating from the flying figures. In fact, an accomplished artist like Kirby uses nearly every gesture or object in his composition to further dramatize his art, and even more important the intent of his story. There is little in this picture that is not deliberately posed and counter-posed for dramatic effect, from the seemingly random position of an arm to a flying shard of debris. Finally, we can clearly see how Kirby uses vectors in the service of continuity, which is something that I have emphasized from the beginning of this series. The King uses various vectors as pointers from panel to panel, as in the case of Bucky’s tossed figure indicating the motion to the second panel. We next see the triangular vector of Bucky’s back, moving our eye to the third panel. The dance of movement continues with the vector of the Skull’s gesture towards panel four, which is picked up by the pistol blasting in that panel. 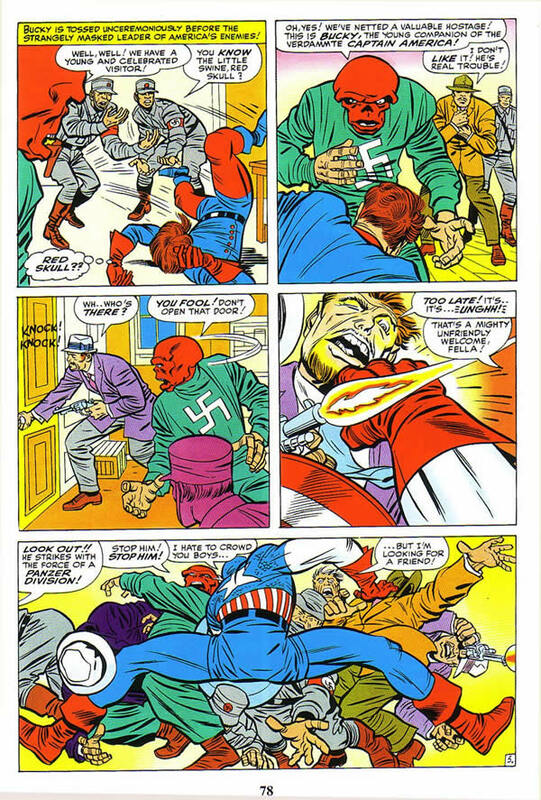 Cap’s arm and shield bring us down to the wonderfully splayed figures in the final panel. With Kirby, it’s all about movement in the service of the story, and vectors help to keep us moving.